This post is a message that was sent to The Phantom. Just a little note – I read the booklet my mate got from you people about the Phantom page. How true – I loved it – The bloke who wrote that must be a good bloke – Just Like us. I’m with you Mr Phantom. 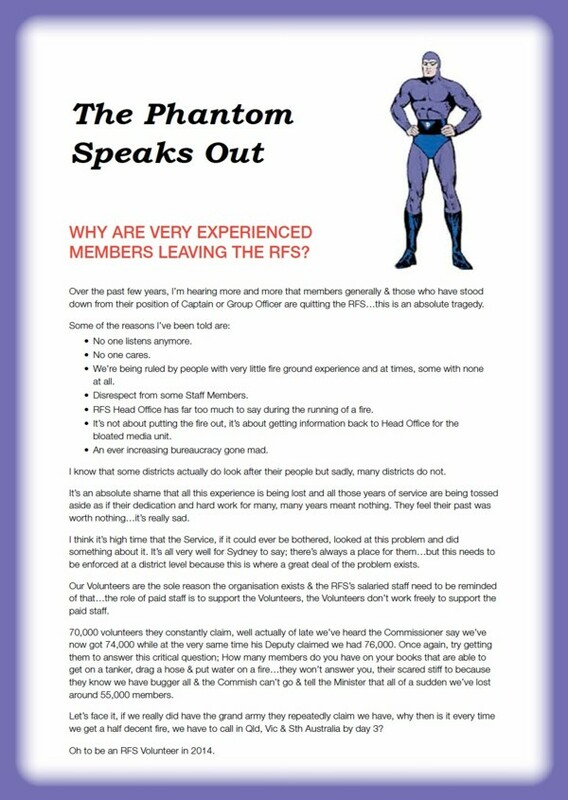 Now one knows the true identity of The Phantom, he sends us some words of wisdom for publication in The Volunteer Firefighter (The Official Magazine of the Volunteer Fire Fighters Association). Why are very experienced members leaving the RFS? Over the past few years, I’m hearing more and more that members generally & those who have stood down from their position of Captain or Group Officer are quitting the RFS…this is an absolute tragedy. We’re being ruled by people with very little fire ground experience and at times, some with none at all. Disrespect from some Staff Members. RFS Head Office has far too much to say during the running of a fire. It’s not about putting the fire out, it’s about getting information back to Head Office for the bloated media unit. An ever increasing bureaucracy gone mad. I know that some districts actually do look after their people but sadly, many districts do not. It’s an absolute shame that all this experience is being lost and all those years of service are being tossed aside as if their dedication and hard work for many, many years meant nothing. They feel their past was worth nothing…it’s really sad. I think it’s high time that the Service, if it could ever be bothered, looked at this problem and did something about it. It’s all very well for Sydney to say; there’s always a place for them…but this needs to be enforced at a district level because this is where a great deal of the problem exists. Our Volunteers are the sole reason the organisation exists & the RFS’s salaried staff need to be reminded of that…the role of paid staff is to support the Volunteers, the Volunteers don’t work freely to support the paid staff. 70,000 volunteers they constantly claim, well actually of late we’ve heard the Commissioner say we’ve now got 74,000 while at the very same time his Deputy claimed we had 76,000. Once again, try getting them to answer this critical question; How many members do you have on your books that are able to get on a tanker, drag a hose & put water on a fire…they won’t answer you, their scared stiff to because they know we have bugger all & the Commish can’t go & tell the Minister that all of a sudden we’ve lost around 55,000 members. Let’s face it, if we really did have the grand army they repeatedly claim we have, why then is it every time we get a half decent fire, we have to call in Qld, Vic & Sth Australia by day 3? Do we really have 70,000 Volunteers? I have researched to find any reason that would justify the fanciful claim of 70,000 plus volunteers. I suppose that all Air Base operators, Remote Area Firefighters and other members of two or more brigades are counted twice, but that still wouldn’t add enough to make 70K. So I looked further and found 14 AFSM’s 1/5000 volunteers. So lets ensure that there are at least 14 Nominations of Volunteers for AFSM’s as applicable from now on.